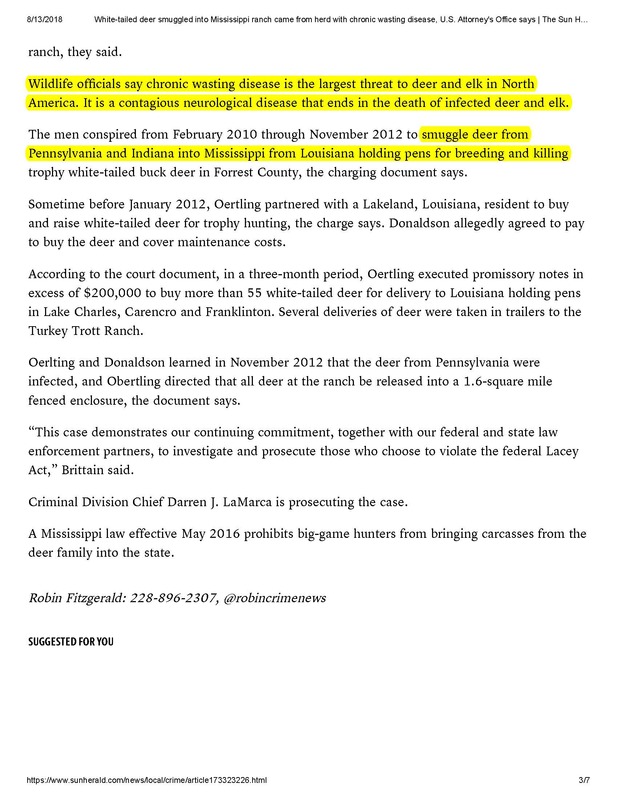 While Congressman Abraham files bill to stop the spread of chronic wasting disease, House Speaker Taylor Barras, 17 Republican state representatives curry favor with politically-powerful dentist Don Donaldson, who pled guilty to illegally and recklessly importing Pennsylvania deer from infected herd into Louisiana. Notice that three of the original four cosponsors of the bill are from the state of Pennsylvania. That’s no accident. Pennsylvania is known to have some of the most prized trophy deer in the nation, but the state’s deer population has also had the misfortune of being afflicted by CWD, which is something Louisiana’s deer population has thus far been spared of. On September 8, 2017, Donaldson entered into a plea agreement in Federal Court in Mississippi in which he pled guilty to a misdemeanor act of violating the Lacey Act. In accordance with the plea agreement and despite the fact it was a misdemeanor rather than a felony to which he pled guilty, Donaldson faces up to a one-year Federal prison sentence or five years probation along with a fine of up to $100,000. Many Sound Off Louisiana subscribers will recall our intense focus this past legislative session on Sen. John Milkovich’s SB-260. The measure would provide licensees of occupational licensing boards, including the Louisiana Board of Dentistry (LBD), who have the misfortune of being called before such a board for an administrative hearing, to have the option to have his hearing adjudicated by an administrative law judge rather than the board itself. The measure was specifically intended to provide relief to licensees, particularly those of the LBD, to avoid a Kangaroo Court proceeding wherein they’d been subject to intimidation, harassment, and Mafia-like tactics to engage in acts that essentially amount to extortion. Sound Off Louisiana has received more pleas from dentists to expose the LBD’s corruption than any other state agency in Louisiana! Many subscribers may recall we exposed Louisiana Senate committee testimony on Milkovich’s bill demonstrating dentists’ anger at the Mafia-like tactics of the LBD. Milkovich’s bill sailed through the Louisiana Senate without ONE SINGLE “no” vote. 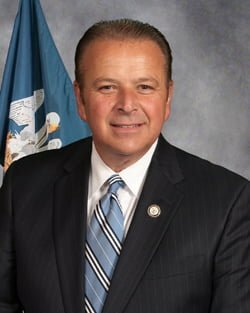 Once his bill reached the House side, where Donaldson could exert his influence over many House Republicans, most especially Louisiana House Speaker Taylor Barras, his bill hit a ton of turbulence. Let’s take a close look at the final House vote on the bill with Republican “no” votes highlighted, shall we? 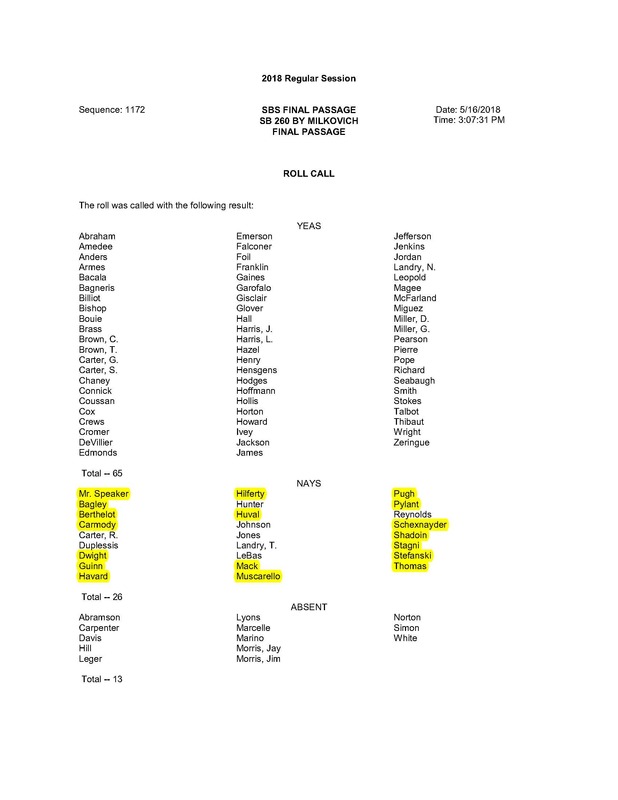 The above vote highlights 18 House Republicans, led by none other than House Speaker Taylor Barras, who voted AGAINST the measure. Hence, they are against providing licensees of corrupt occupational licensing boards such as the LBD, the fundamental right to have Kangaroo Court proceedings such as the LBD has extensively conducted in the past be adjudicated by a fair and impartial administrative law judge instead of the Mafia-like members of the board! In short, we at Sound Off Louisiana view ANY legislator who voted “no” on the measure to be unworthy of serving in ANY elected capacity! PERIOD!!!!!!!! We have therefore framed that vote, and we will actively oppose the candidacy of any legislator listed under the “no” column! PERIOD!! We have heard speculation that Speaker Barras, who is term-limited, may seek election as Lieutenant Governor next year. If so, we will oppose his candidacy tooth and nail!! So, why did Barras (and 16 of his Republican colleagues) cast the “no” vote? Well, that would be due to Donaldson’s extensive political contributions. The extensive contributions outlined on the preceding link only include direct contributions from Donaldson and do not include dental PACs. One lobbyist whom we contacted stated, “Donaldson has a bazillion dollars and he makes use of it with legislators in Louisiana.” Let’s focus in strictly on Barras’ contributions, since his vote of “no” was the most stunning of all to us at Sound Off Louisiana, shall we? So, for a mere $4,000, it would appear Barras is more than happy to permit the LBD’s historical corruption to continue unabated! Chenevert is immediately cut off when she merely mentions Donaldson’s name 9 seconds into the above video. If one clicks on this link of Senate committee testimony on Milkovich’s bill, one quickly sees the “standard close-out letter” for which Louisiana Inspector General Stephen Street has obtained a patent indicating, “the evidence (of corrupt practices by the LBD) did not support criminal charges.” One dentist has led the charge entailing LBD corruption, and he’s repeatedly expressed his frustration directly to Louisiana Inspector General Stephen Street and was kind enough to include us on his latest such communication of Friday, August 10, 2018. Nevertheless, all he ever receives from Street is that patented letter of excuses from Street regarding why his office will take no action and instead, true to that patent he’s had since 2008 when he took office, has “closed our file” on the matter. Our dentist source also stated that two inspectors with Street’s office resigned simultaneously to the closing out of Street’s “investigation” into the LBD. Louisiana citizens often ponder how corruption can be so rampant in Louisiana. 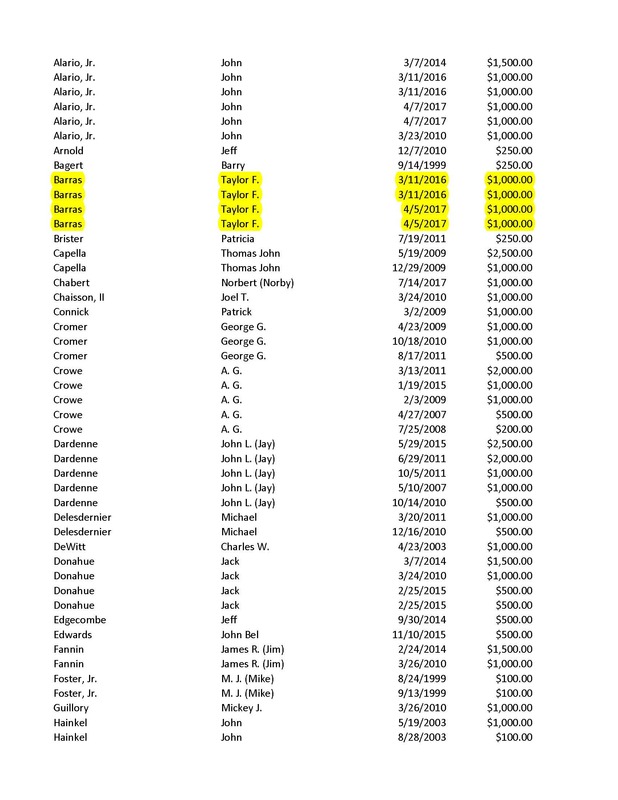 One reason may well be that a picture is emerging wherein Street, who cares only about continuing to receive his own salary (lest he end up having more Federal tax liens filed against him), has a ton of dirt on members of the Louisiana legislature. He is willing to be the straw fake inspector over Louisiana governmental operations and easily manage to find ways to “close files” in exchange for corrupt legislators agreeing to continue funding his office, which has been nothing short of an unmitigated disaster since it was awarded limited law-enforcement status in 2008. That single act is now appearing to be one of the biggest mistakes the Louisiana Legislature has ever made in its history! Okay, so what about those deer? 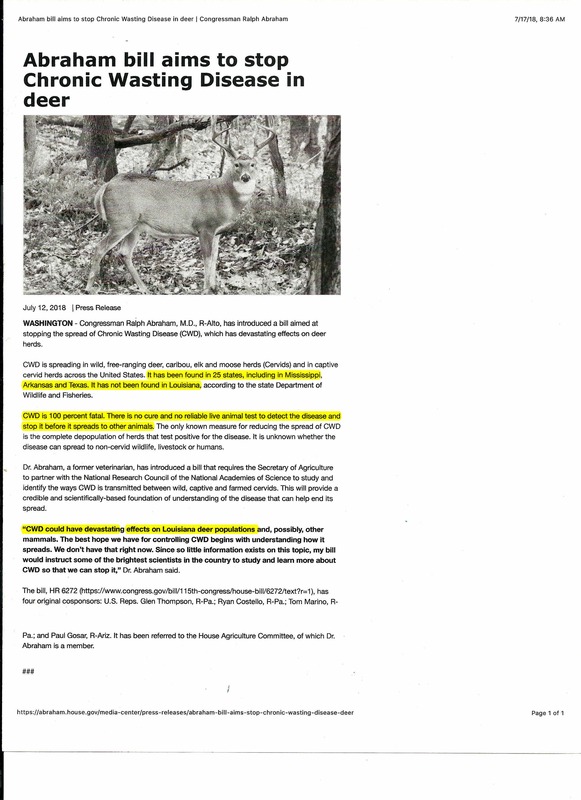 Well, yesterday, August 13, 2018, Federal judge Keith Starrett issued the final order for the depopulation of the deer at Turkey Trot Ranch. 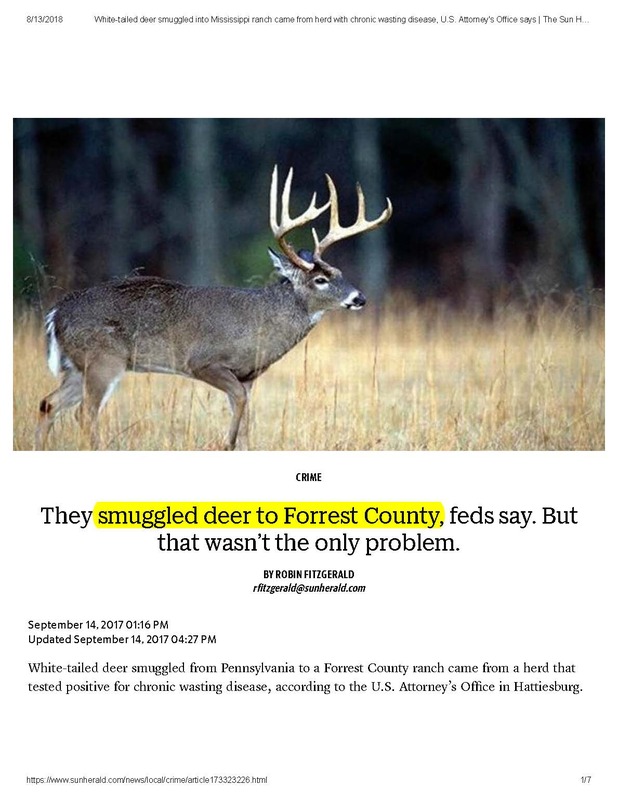 The judge weighed the potential harm to Mississippi’s deer population if a CWD-infected deer were to find its way into Mississippi’s deer population (the incubation period for CWD is from 18 months to five years) versus the waste of “destroying a perfectly healthy deer herd,” so he implemented a five-year quarantine on the deer. Donaldson lost on his desire to have an outside firm conduct testing during that five-year quarantine. 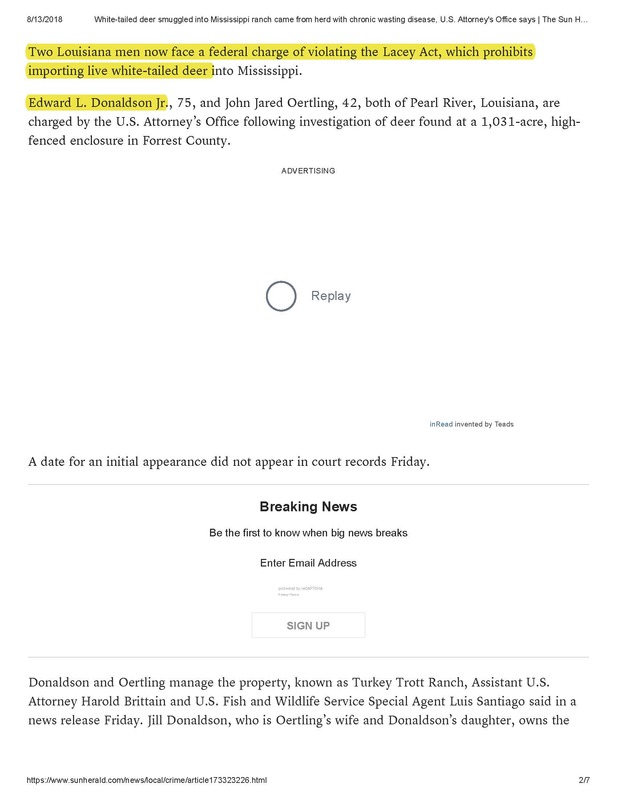 Donaldson was further ordered to submit $120,000 to the Court’s register to cover the Mississippi Department of Wildlife and Fisheries’ estimated cost of testing and monitoring the herd during the five-year quarantine. Now if we can only seek an order from a Louisiana Federal judge depopulating Louisiana’s legislature of members who would cast the kind of INEXCUSABLE votes depicted above on Milkovich’s bill and the sorry excuse for an Inspector General who should protect against Louisiana governmental agency corruption which runs so rampant at agencies like the LBD, we as Louisiana citizens would be MUCH, MUCH better off! Donaldson has taken a number of those legislators to his hunting camp in the past. He was just trying to get it ready for them. Damn the consequences. Previous Previous post: LSPC calls for sternly-worded letter to Ouachita School Board expressing outrage at retention of Sterlington High football coach Jack Goode. Next Next post: State Rep. Johnny Guinn, newest member of AFP’s “Taker’s Dozen,” has also openly advocated “taking” from bidders at auction through illegal practice of shill bidding.